Here are some best free online business startup cost calculator websites for you to use. With these simple web applications, you can estimate the amount that you need for funding your startup. Here these startup cost calculators take some information about that type of business you want to start, the number of customers to start with, your down payment, office expense, yearly user growth, yearly user churn, and some others. Using these parameters, they can draw the graph between profits and users that you can analyze. Before thinking of starting your own business, you need to do some calculations mainly about funding and managing your products and other assets of the business. And that is what you can do with the tools mentioned in this list. You specify current amount you have and how you want to spend it on the business assets. And then these websites will tell you what you exactly need to make your business run and profitable. Some of them even show you the graph for the profits that you can analyze. Startup Calculator is a one of the best free websites that you can use to calculate how much funding your need for you new startup. Without any sign up, you can calculate the startup cost and even export the details to Google Sheets. But for exporting results, you will have to sign up for an account. It basically takes parameters related to revenue and cost and then show results. And it shows user-profit graph for the next five years as well that shows the growth in your profits based on the specified parameters. 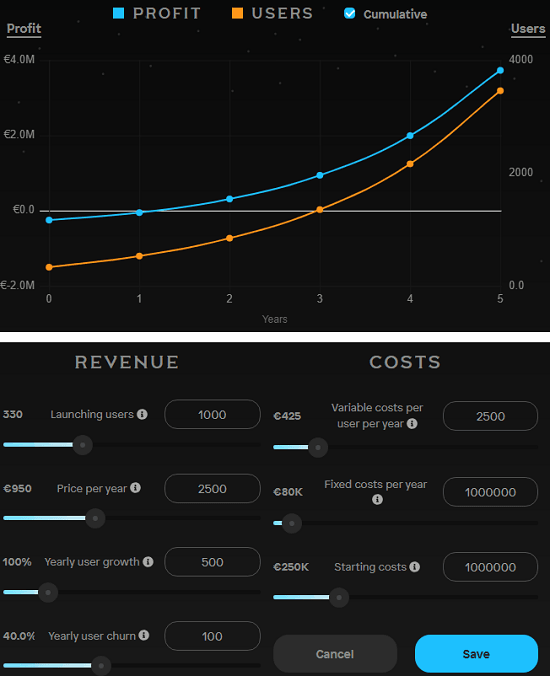 For cost and revenue, you have to specify parameters like launching users, price per year, yearly user growth, yearly user churn, variable cost per user per year, and some others. Basically, there are sliders corresponding to each aforementioned parameters and you have to specify the amount in Euros. And based on your inputs, it plots a real-time graph for you that you can analyze. Also, on the top right corner, you can see how much profit you will be earning after 5 years and how many users will be there. Also, you can share this over Twitter, LinkedIn, or WhatsApp if you want to. 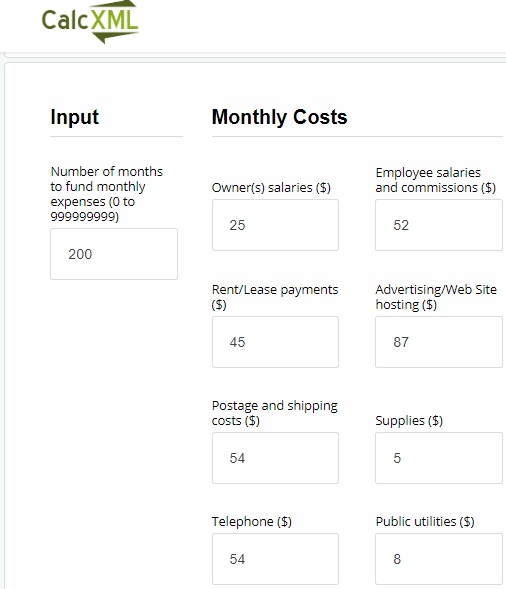 Business Startup Cost Calculator(home) is a very simple and straightforward tool that you can use to calculate how much money you need to start your small business. Here this tool takes major expenses you are willing to spend on one time business assets and other monthly recurring things. For getting best results, you will have enter the exact estimation for each expense item that you will specify. Basically, here you have to specify the cost for office installation, office furniture, operating cash, rent, signage, legal fees, fixtures, computer hardware, software, health insurance, all the salaries, franchise fee, utilities, internet connection, and some others. You just have to specify the cost there and it will show you the final cost for your startup. There is no need to sign up to use this tool. There is a lengthy form on the web page that you have to fill out and then in the end, hit the “Calculate” button and it will open a new page where it will show how much your startup is going to cost you. The tool is simple but there are no other ways to download the results or share them. You just give it the input parameters and it will take care of the rest. Simple as that. 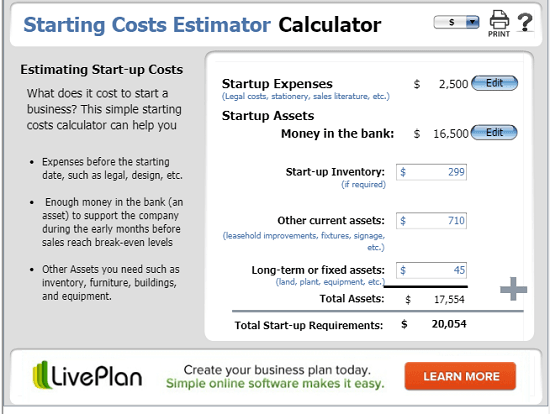 Starting Costs Calculator is another free tool that you can use to calculate how much your startup will cost you. Here it asks you to enter details about the startup assets and startup expenses and then shows the overall calculated cost for the final startup. Apart from this, it even lets you specify cost of startup inventory, cost for the fixed or long-term assets. It keeps adding them in the final cost and you can see the result. If you want to change cost of some assets in this then you can do that. The interface of this tool is simple and you don’t need to sign in or register your email addresses. This tool is written in Flash, so you just have to enable that and then the interface of the tool will appear. 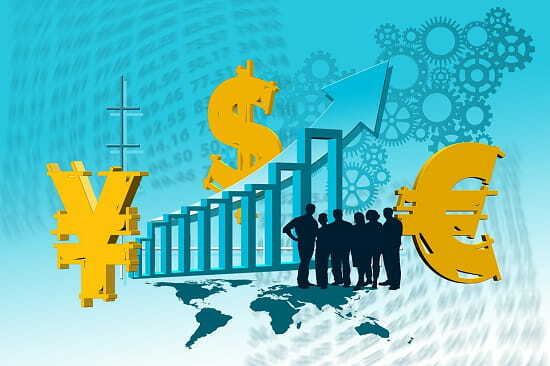 In the different fields, specify cost for different assets and proceed further. After specifying cost for all the parameters on the tools’ interface, it will simply show you the final result in terms of dollars. After analyzing the result, if you want to change cost of some assets in the list then you can do that. And it will adjust the final result automatically. However, here it doesn’t show you the graph for your visualization. There is no export option but you can print the calculator result. 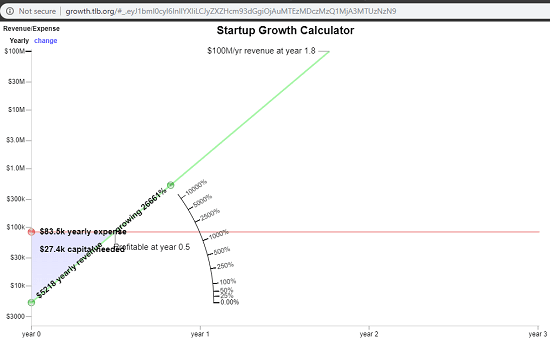 Startup Growth Calculator is an interesting business startup cost calculator tool that you can use. Here it offers you a graphical interface where you have to adjust the lines for weekly expenses, weekly revenue, capital needed, growing rate, etc. You specify cost for these on the graph and see then final result. You can analyze the graph to understand whether your startup will be successful with the current estimated cost of the business assets. Just like most of the tools in this list, you are not required to create an account here. Just go to the homepage using the above link and then simply adjust the lines on the graph based on your estimated cost. The graph will be adjusted for you and you can easily analyze that. By default there is no option to export the report. But the graph that it shows can be downloaded as an image. You just generate the different graphical analysis and simply right-click on the graph to save it as an image. CalcXML provides a simple yet effective startup cost calculator that you may like. Here this simple tool takes cost for business startup assets from you and show you the final result. There are a lot of parameters you can specify the target the correct results. On the main interface, it lets you specify details about cost for the starting inventory, public utility deposits, advertising/promotional cost, license fees, legal fees, office furniture, office equipment’s, cash on hand, supplies, lease payments, owner salaries, and some others. The interface of the tool is simple and you don’t have to create an account to get started. 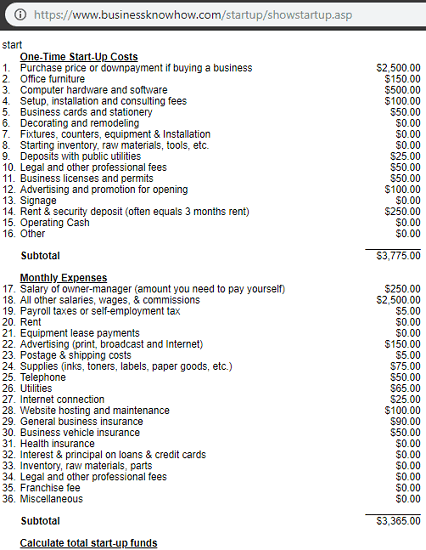 Land of the main web page of this tool and then start specifying the cost for the business assets listed there. After specifying all these parameters, just scroll down and hit the “Calculate” button. It will take a couple of seconds to process the result and will show it to you. You can analyze the result that it shows but you cannot export that. If you want to reuse the tool with different values then you can do that. These are some free online business startup cost calculator websites that you can use. All the websites that I have listed above can easily be used by a normal users to quickly calculate the cost or funding he needs to start building his own startup. You just specify some parameters related to startup assets and revenue and get the result in a few seconds. Also, some of the above tools, you can see the profit graph along with the startup growth. In case you need free business startup cost calculator websites then you would love this post. Personally, I liked Startup Calculator, Starting Costs Calculator Estimator, and Business Startup Cost Calculator. But you are free to check out other tools to do the same as well.